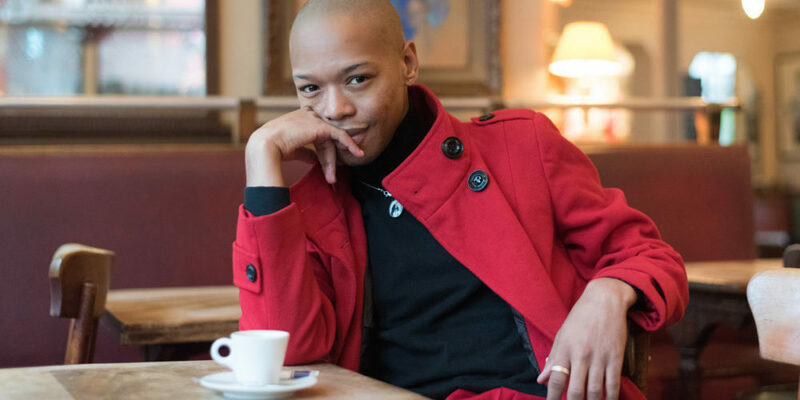 Gay South African singer Nakhane and I recently met in a Parisian café not far from the Place de la Bastille. 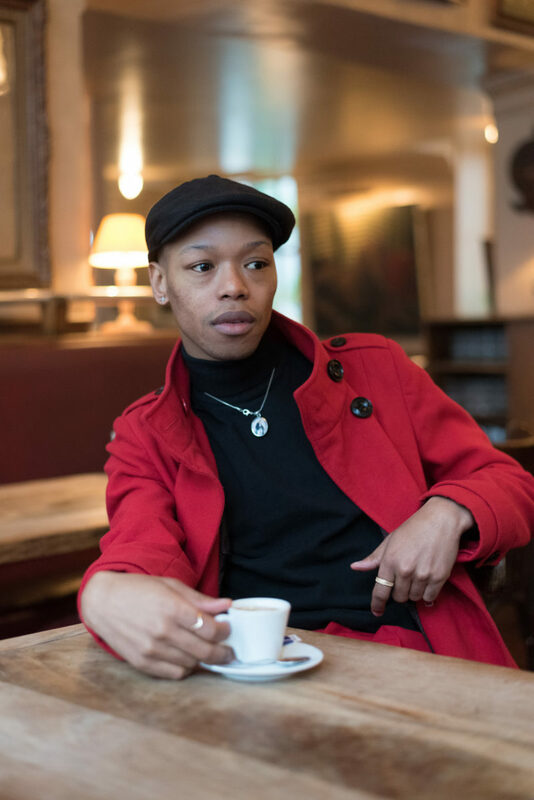 Born in 1988, Nakhane is in France to promote his new EP, Clairvoyant, released a few weeks ago. This EP — which includes two original songs, a David Bowie cover and a remix — is meant as a prelude to Nakhane’s forthcoming sophomore album, due in 2018. The singer/actor/writer speaks in a soft voice and with a candor many artists lose after doing too many interviews. Since we were there to talk about music, I first asked him to describe the songs on his new EP. He goes on, “No one talks about the mundane idea of a relationship or love, how it feels to love somebody very much but that week you’re not sexually attracted to them, how you can love someone very, very much but he’s driving you nuts for the day and you literally want to kill him and you look at him and think, ‘Oh, it’s the best thing in my life right now.’ … Those little feelings that no one talks about. Most of those feelings are in literature. It’s rare that you get them in songs. “Sweet Thing,“ the cover of a David Bowie song featured on his 1974 album Diamond Dogs, was a commission for a tribute album. Nakhane recorded it on his own in his home studio. In it, he plays several instruments and even adds some lyrics. “How arrogant of me!” he laughs. “This album will be about no longer being a Christian,” Nakhane says. According to him, his forthcoming record will be very different from his debut album, Brave Confusion, released in 2015 under the name Nakhane Toure. He continues, “Because this thing was part of everything of your life — before I ate, I prayed; when I went to the house, I prayed; when I slept, I prayed — and suddenly this thing doesn’t exist anymore. So it’s a time of extreme anxiety and depression, which is great fodder for art!” He laughs. Nakhane says he’s not a Christian anymore, but one can’t help but notice the Virgin Mary necklace he wears, and his cross-shaped earrings. Many have heard of Nakhane thanks to his role in The Wound, directed by John Trengrove, released in 2016. The movie revolves around the rites of initiation of the Xhosa tribe in South Africa. Nakhane — who is also a Xhosa — plays a closeted elder. The rites of the Xhosa tribe are sacred and are supposed to remain secret. Prior to its release, the movie was harshly criticized, and Nakhane received a lot of death threats and insults. He was accused of desecrating the rites and of being a traitor to his own people. “All those people who were angry realized it wasn’t such a big deal when they saw it,” he says. 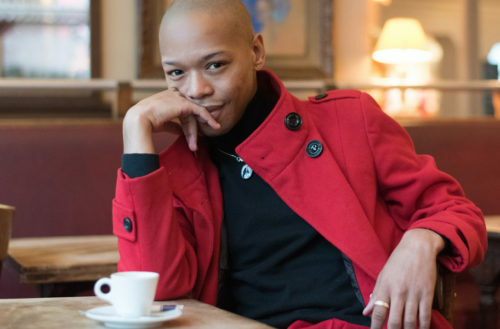 “I spent my younger years just wanting to be Marvin Gaye,” Nakhane says. How to describe Nakhane’s music? There’s no simple answer, and his answer isn’t simple either. He continues, “My friends laugh at me when I call it pop music. They go, ‘Oh, you think you make pop music — that’s cute!’ I’m not offended when people call it other things. My music teacher hears so much George Michael. I don’t hear George Michael at all in my music, but he was such an important figure in my life when I was in high school because he was the only gay musician I knew. Talking about his vocation as an artist, he thinks of African culture before colonization.